On this page you will find an overview of scale models produced by TMCSaceleModels.com. Information on where to buy these models is below the models if applicable. 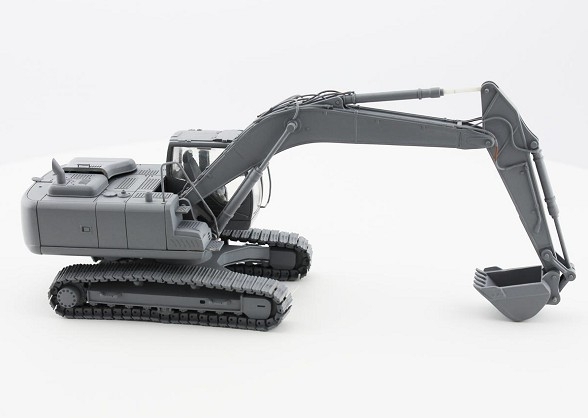 TMC Scalemodels has not been resting on their laurels and has been busy working on their next release, the Hitachi ZX470-5. Again the level of detail and realism is truly exceptional. The undercarriage frame has the lower roller detailing cast into the track frames with access ladders fixed to each side, complete with ridged anti-slip top surfaces. The idler wheels are tensioned keeping the individually linked tracks taut while the three upper rollers are free-rolling. The drive wheels have bolt fixing details highlighted on the final drive housings with the tracks also showing bolt head detailing on each dual grouser pad. The body casting highlights all the ridges of the door panels and covers with two opening upper covers with two opening upper covers revealing the internal engine compartment which houses the replicated diesel engine. The side grill panel slots allow a glimpse of the internal radiator panel with black highlighted anti-slip panels located on the upper engine bay surfaces. All the safety railings and grab rails are produced in metal and accurately scaled while fine metal handles are attached to the engine covers and inside the opening cabin door. A service platform is fixed along the side of the upper carriage with a photo-etched walkway for added realism while access steps behind the cabin lead to the upper engine area. The cabin interior has been authentically modelled and painted in a two-tone grey with the Hitachi name printed on the seat bck and a side console housing the monitoring display screen. The joystick controls are mounted to the integrated armrests,complete with safety hydraulic shut-off lever while the flooring has a ridged surface texture with foot controls and steering levers. 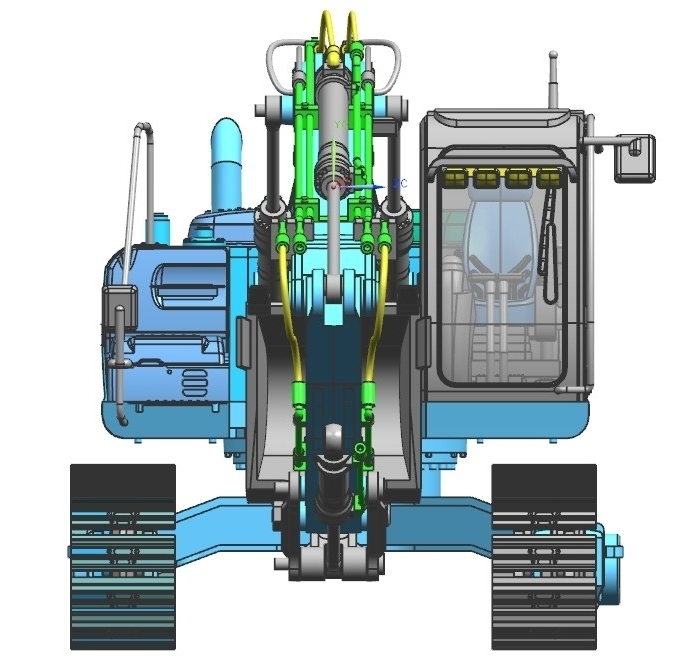 The Hydraulic hoses and piping throughout the model are really well executed with all fixed piping raised from the boom with armoured flexible hoses fitted to the stick and bucket cylinders. 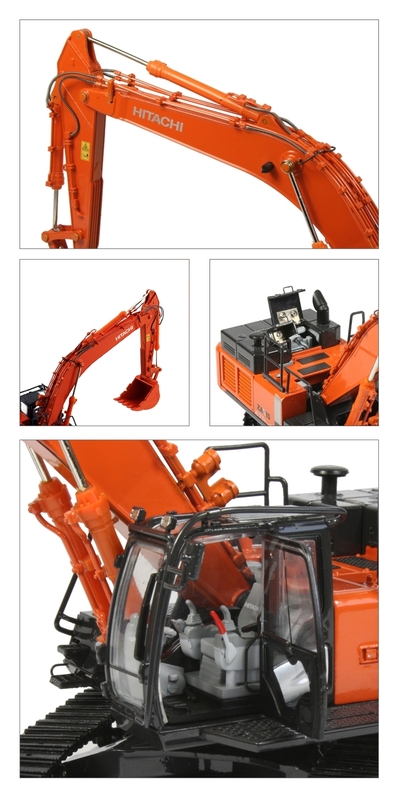 The stick has auxiliary hydraulic lines on both sides hinting at a possible future model with powered attachment. The model will be on sale at the Hitachi Merchandising stand at the Bauma, Munchen – Germany. While the ZX870 raised the bar and set a new standard, the ZX250-5 has surpassed it with excellent attention to detail. 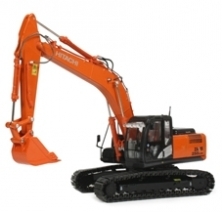 Hitachi Zaxis ZX250LCN-5 tracked excavator from TMCScaleModels The cabin interior is almost life-like with every aspect modelled, from the safety cut-off lever and joystick controls integrated into the armrests to the foot controls, side display screen with decorated surface and metal safety rails inside the cabin. The opening door has tiny printed labels with inside grab rail for true realism. The engine cover can be raised to reveal the internal engine and cooling components which have been authentically painted with photo-etched safety screens clearly visible. The upper engine housing has inset photo-etched plates with a textured anti-slip surface which look great and small safety markings have been printed on the counterweight. The hydraulic piping fitted to the model is very nicely done, with all the fixed piping raised from the boom with silver connection valves and flexible hoses fitted to the hydraulic cylinders which have a very smooth operation with enough friction to hold any position chosen. Armoured hosing has also been added along with an auxiliary feed for attachments. Another nice feature is the removable bucket, allowing aftermarket attachments to be fitted. The undercarriage frame has tensioned idler wheels keeping the linked tracks taut with a nice smooth rolling movement. The surface detail is good with inside structural frame detailing and printed markings. The paint finish is to a very high standard with crisp printing of the Hitachi markings and machine designation, topped with small safety labels on the rear counterweight and stick. Excellent replication of the hydraulic piping and armoured flexible hoses.